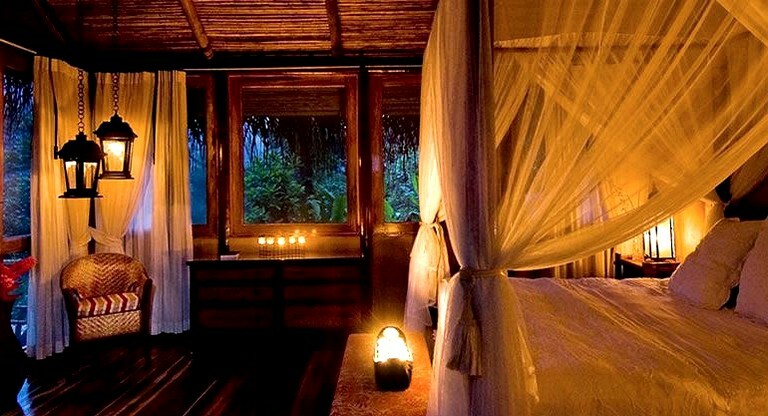 Canopy Honeymoon Suite: The bungalow has a high, thatched roof, plantation teak floors and large 180 degree jungle panoramic windows. 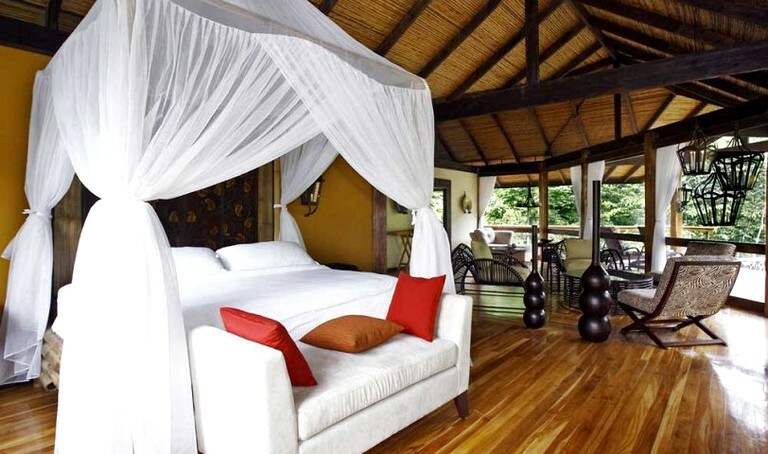 It is elegantly furnished and features a king size bed and a canopy bed. 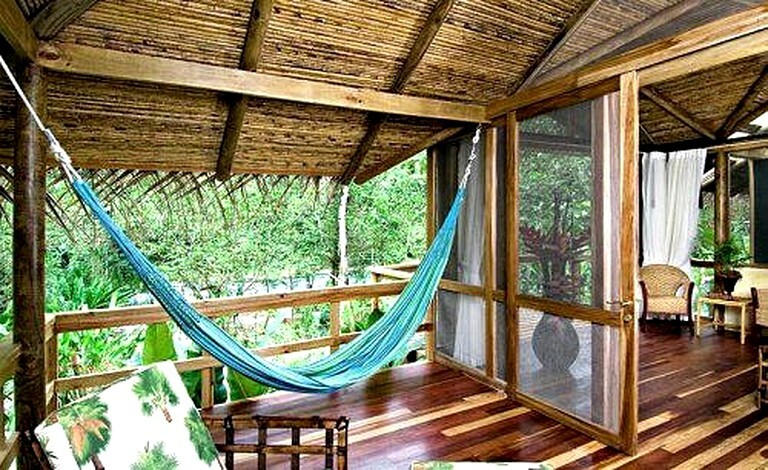 The adjacent covered deck includes a hammock and a rattan sofa. 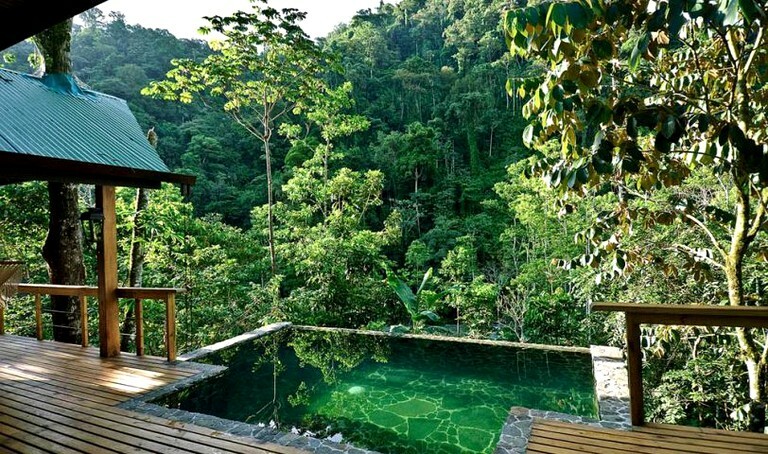 The entire suite opens onto a a sundeck with a spring water stone swimming pool. 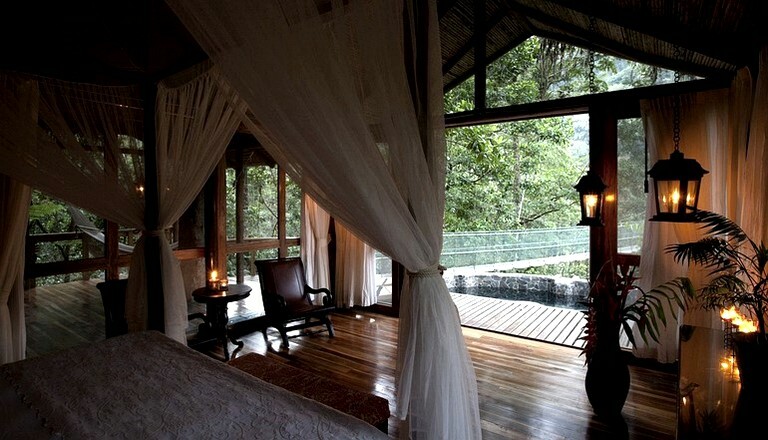 A private suspension bridge leads from the deck to a platform high in a massive jungle trees offering spectacular views of the Pacuare River and rainforest. On mornings and evenings, you can spot exotic birds from your aerial perch. 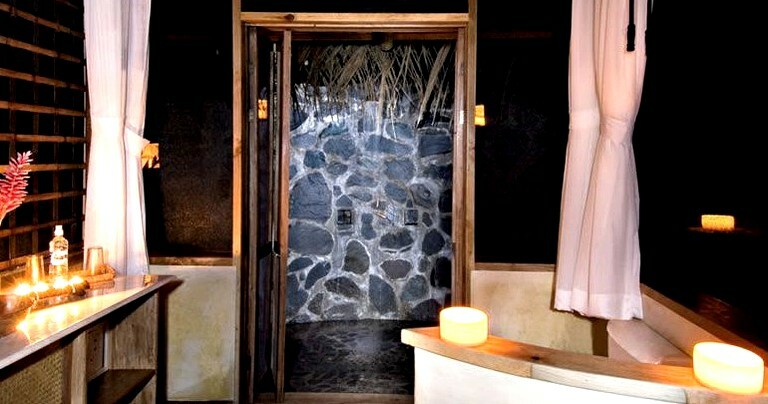 The spacious bathroom is equipped with a solar heated shower and hand-painted ceramic sinks set in a marble counter. 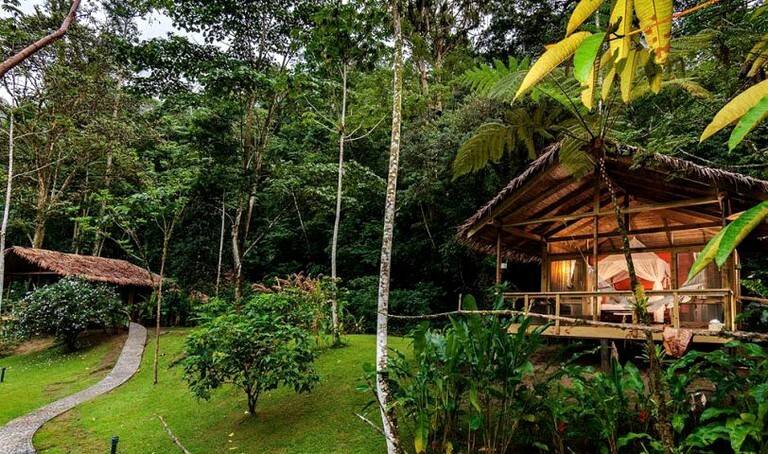 Linda Vista Honeymoon Suite: The spacious 2,476 sq ft. bungalow is perched on a lush and secluded forested ridge overlooking the Pacuare River and rainforest. 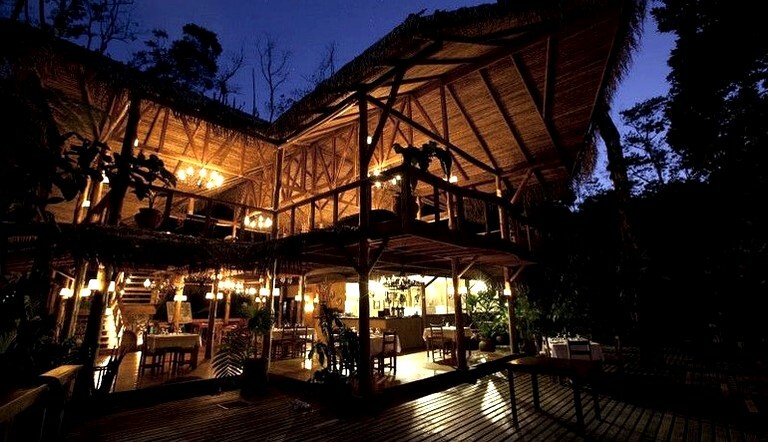 It is elegantly decorated with polished hardwood floors and sloping cane ceilings. Its screened windows and sliding doors let in plenty of light and tropical breezes. It is beautifully furnished with couches, armchairs and a king size canopy bed and is complete with high-quality mattresses and 3,000-thread cotton sheets. 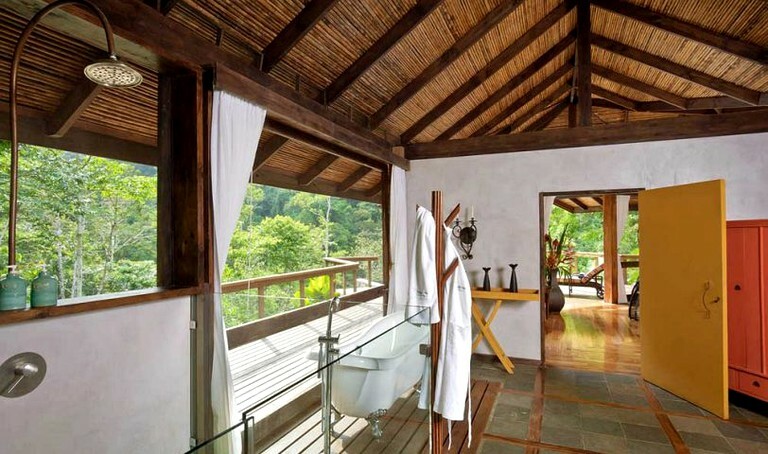 The airy bathroom has an indoor and al fresco shower that overlooks the rainforest. 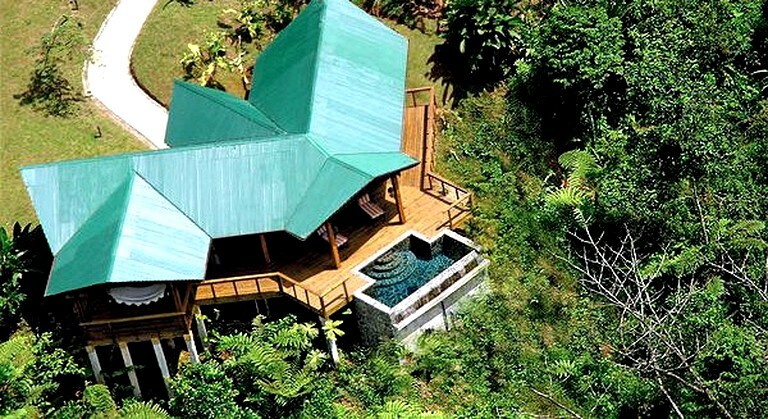 The entire accommodation opens onto a wooden deck with a private swimming pool fed by spring water. Moreover, the suite has a room safe, bathrobes and telephone to communicate with main building, as well as an Eco-concierge to help with tour reservations, general information, etc. 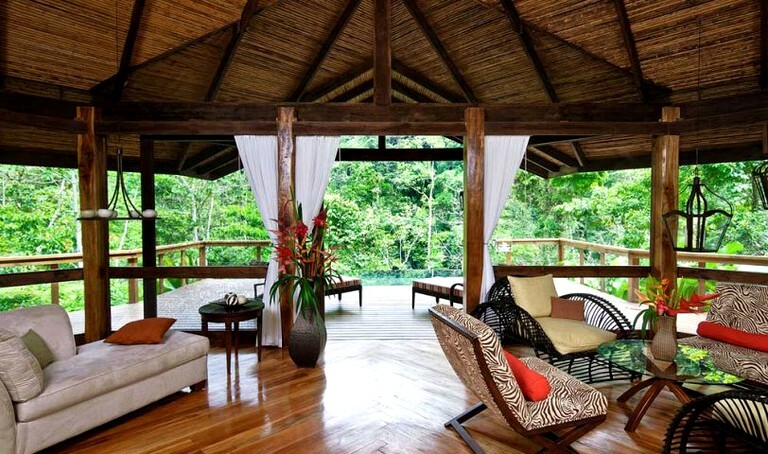 Linda Vista Suites: Perched on a ridge amidst stunning tropical greenery, the 4 bright Suites are 2,476 sq ft. and offer spectacular views of the Pacuare River and forest. They are of simple, natural design and exquisite decorations that complement the natural atmosphere. 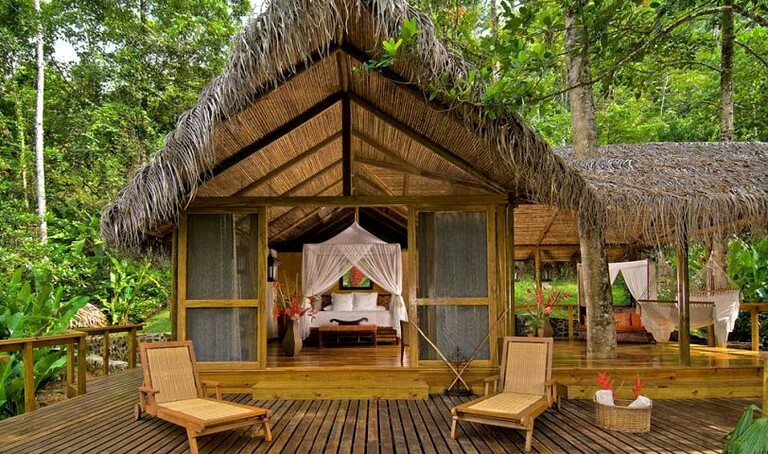 They are equipped with a king-size bed with exclusive Simmons Beauty Rest mattress, Egyptian cotton sheets, leather chairs, a spacious bathroom with indoor and outdoor showers, and a long deck with a private pool fed by spring water. 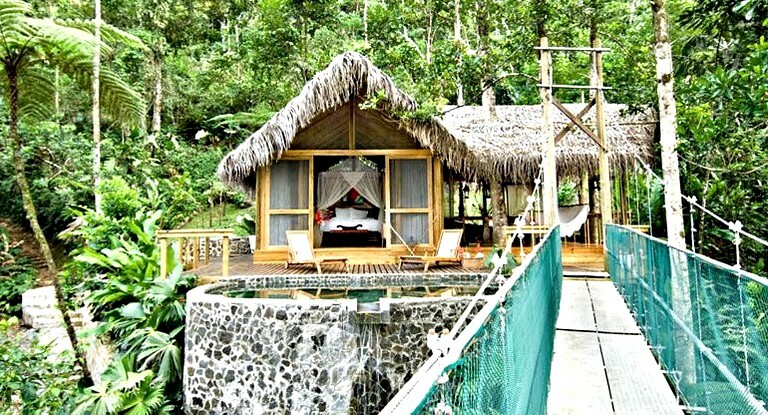 Each bungalow was built with special attention to the hillside's topography so that guests can enjoy breathtaking views of the river and forest from every area, be it the bedroom, living room, bathroom or pool. 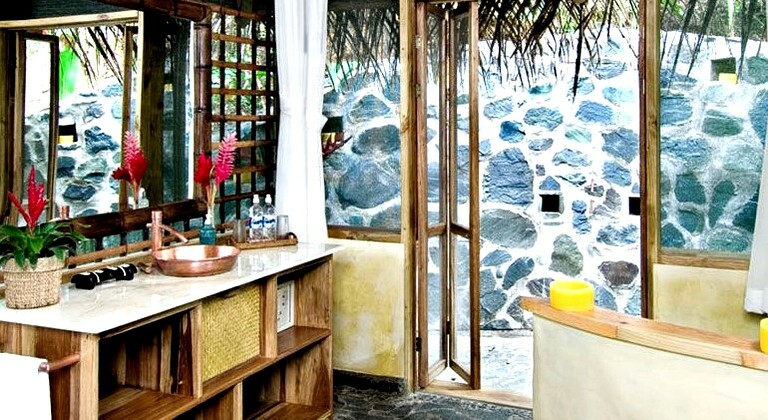 Each accommodation has a mini bar, room safe, bathrobes, telephone and Eco-concierge. 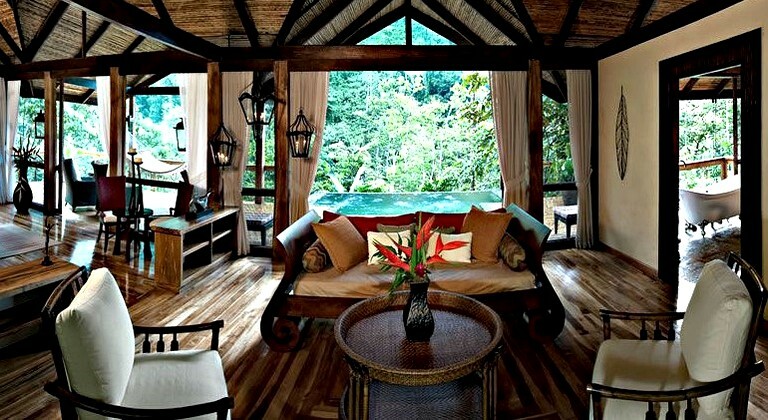 River View Suite: The 670 sq ft. palm-thatched river view suite includes a private terrace and opens on to a landscape of tropical bush and imposing vine-draped trees. 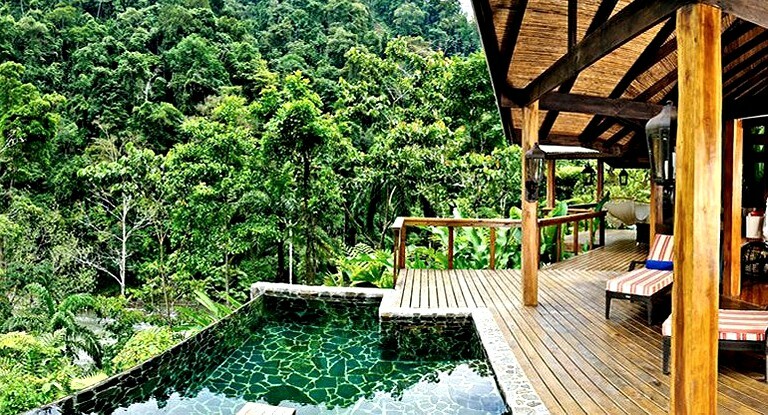 It also features a raised hardwood deck offering impressive view of a massive wall of rainforest that cascades down a mountainside opposite the Pacuare River. The suite includes a canopy king size bed with crisp 300-thread Egyptian cotton linens and a Beautyrest mattress® of startling quality. 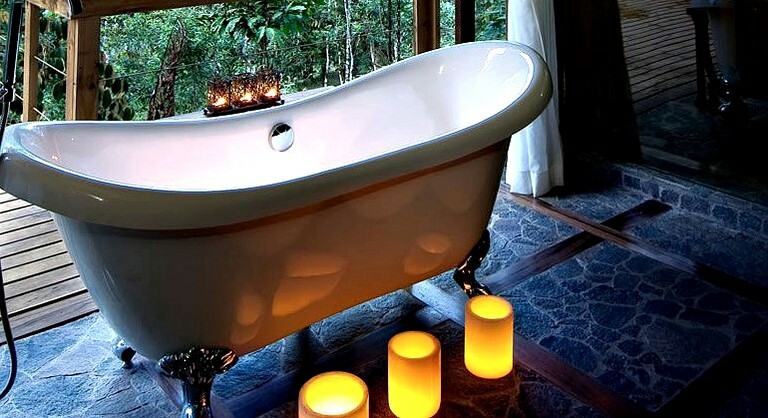 The fully tiled ensuite bathroom comes with burnished copper fixtures and offers a 360 degree jungle view. 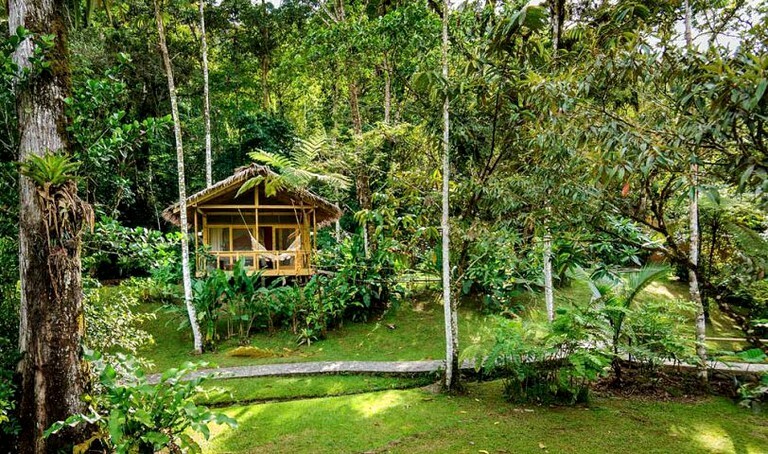 The nearby open air shower with solar heated water lets you soak up the quiet sounds and enticing scents of the rainforest. 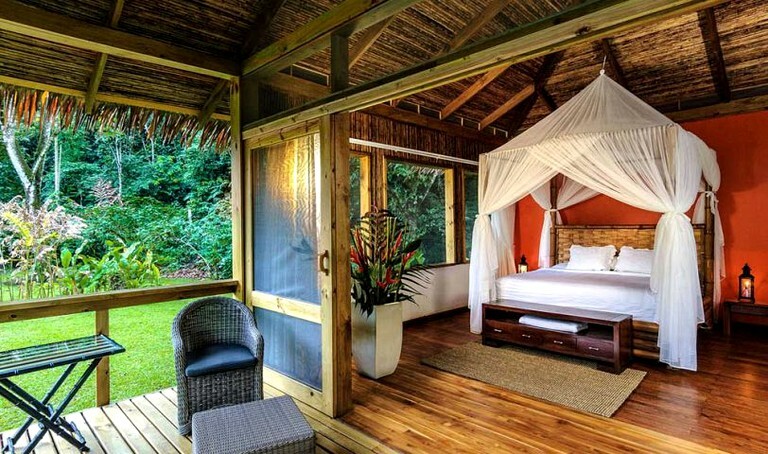 Garden View Bungalow: This palm-thatched lovely bungalow includes a canopy king size bed, futon couch, hardwood flooring, private terrace and spacious bathroom with burnished copper fixtures, open air shower with solar heated water and a 360 degree rainforest view. 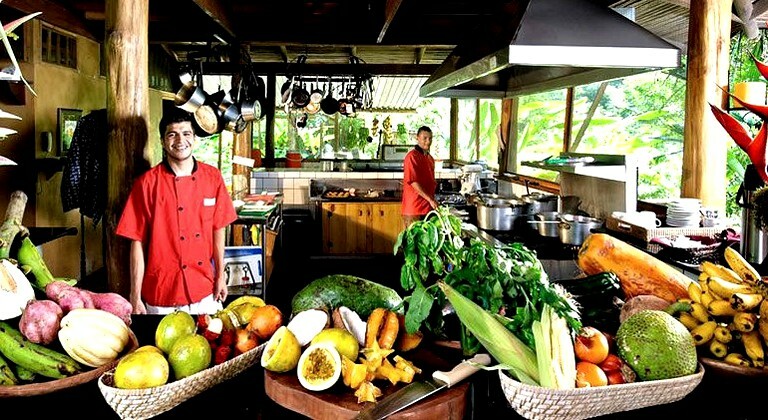 Experience a unique fusion of authentic Costa Rican haute cuisine and exotic dishes in our restaurant. Our local and well-trained kitchen staff is not comprised of a chef, but simply consists of talented local people who love to cook. 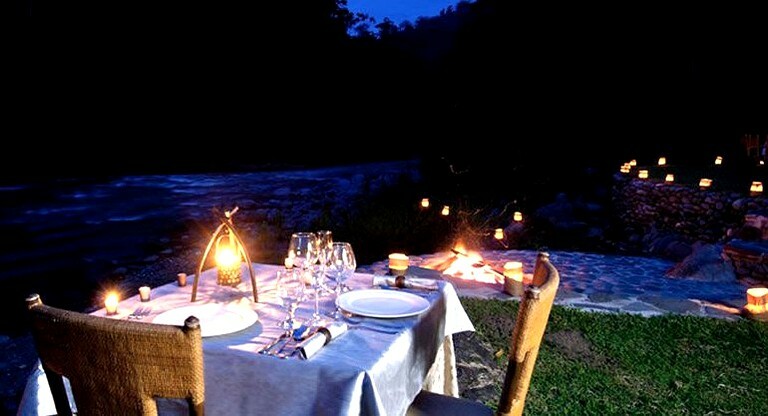 Private, romantic candlelight dinners can be arranged along the river banks accompanied by crackling fires and soothing sounds of the water and frog chirps. The menu could look like this: Leek soup or a pastry appetizer followed by a arid-eye rib with jumbo shrimps, veggies and potatoes, or a sea bass filet with jumbo shrimps accompanied by veggies and a balsamic vinegar sauce over jasmine rice. For dessert, you might have a chocolate soufflé with ginger ice cream. Pacuare River White Water Rafting Trip: Thrilling rapids coursing through majestic canyons and the amazing tropical rainforest. Canopy Adventure Tour: A unique tour along a series of transverse cables. Pacuare River Inflatable Duckies Tour: Paddle down gentle streams in an inflatable kayak and enjoy the exotic flora and fauna. Tropical Canyon Tour: Experience the adventure sport of canyoning, combining hiking, climbing and rappelling. 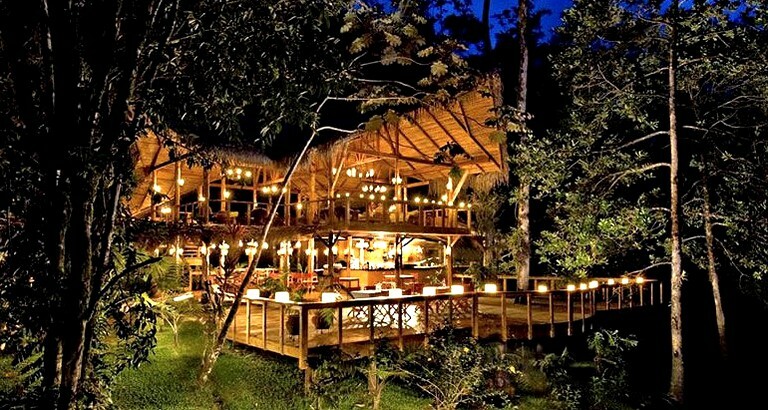 Day Break Activity Tour: Enjoy the colors and life of the tropical rainforest, observe the exotic flora and fauna of the jungle. 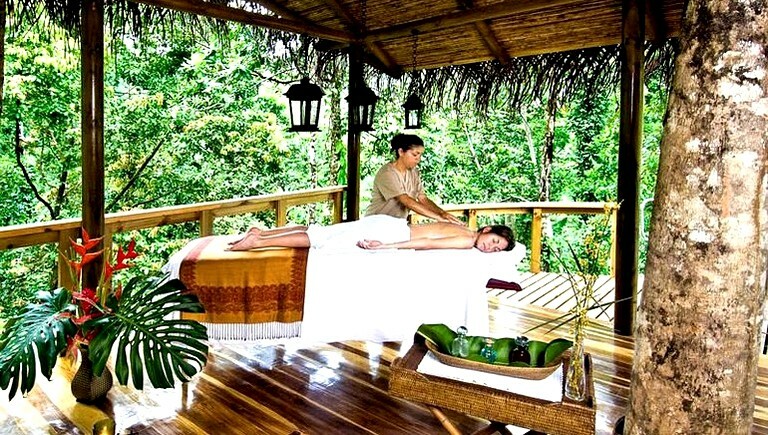 Massage Treatments: Let yourself be pampered by a deep tissue Therapeutic Rainforest Massage. The One World Expedition 'Plant a Tree Program': Actively support the 'Bajo el tigre' elementary school and at the same time contribute to reforestation by taking part in The One World Expedition 'Plant a Tree Program'. Horseback Riding: Experience a guided tour through the amazing scenery by horse! Cabecar Indian Tour: Follow the century old trails of the Cabecar Indians and visit with a Zutkia, or Cabecar medicine man and learn some interesting facts about their traditions, customs and unique relationship with nature.